Mardi Gras – Field trip? Can we count Mardi Gras as a field trip? Probably not! But, being a small town girl from Georgia, I never imagined the fun that a family could have at Mardi Gras. And, believe it or not, there is a great deal of history involved in the holiday. It is like exposure to another culture! It is so much more than what the rest of the country sees on television. 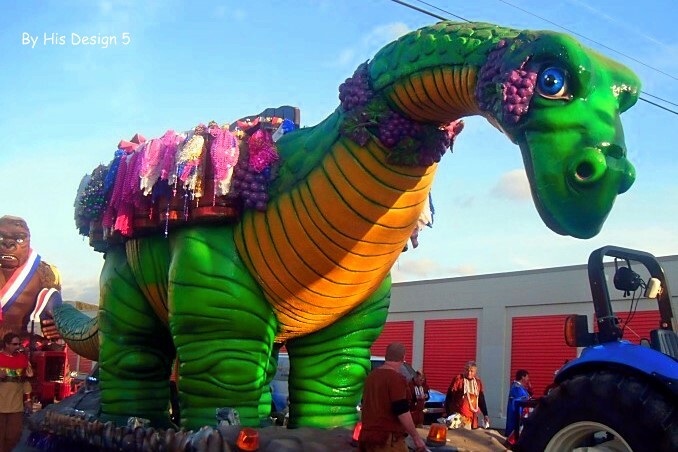 If you are confused as to why we go to Mardi Gras parades, click here to see an earlier post. Now, I would like to share some of the history of Mardi Gras with you. This is information that I have heard from native New Orleanians as well as from research. In New Orleans, Kings’ Day (January 6) simultaneously ends the Christmas season and fires the starting pistol for Carnival. Also known as Kings’ Day or Twelfth Night, Jan. 6 celebrates the arrival of the three kings at Jesus’ birthplace, thus ending the Christmas season. It was Pope Gregory XIII who made it a Christian holiday when, in 1582, he put it on his Gregorian calendar (the 12-month one we still use today). He placed Mardi Gras (or Fat Tuesday, the final day of the Carnival season) on the day before Ash Wednesday, the first of Lent’s 40 days preceding Easter. Mardi Gras arrived in North America with the LeMoyne brothers, Iberville and Bienville, in the late 17th century, when King Louis XIV sent the pair to defend France’s claim to the New World territory of Louisiana. The explorers found the mouth of the Mississippi River on March 3, 1699, Mardi Gras of that year. They made camp a few miles upriver, named the spot Point d’Mardi Gras and partook in a spontaneous party. This is often referred to as North America’s first Mardi Gras. However, it is just as likely that the weary explorers were simply celebrating the fact that they were still alive.A couple of decades later, Bienville founded New Orleans and soon Carnival celebrations were an annual event highlighted by lavish balls and masked spectacles. There is actually a large debate between natives of New Orleans and natives of Mobile, AL regarding where the first Mardi Gras was actually held. For more the history, click here or here. In addition to its unique history, Mardi Gras also has an unique language. 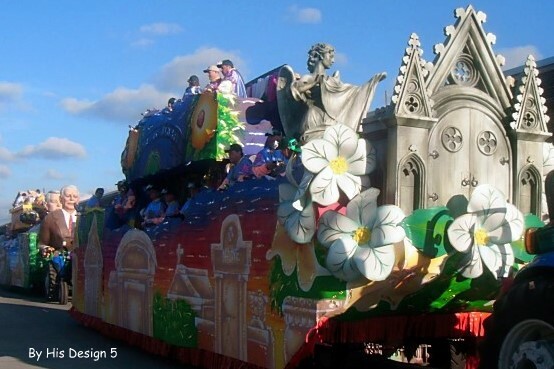 Krewe – a group of men and/or women who join together and host a ball and /or parade during the Mardi Gras seaon. There are about 70 krewes in the New Orleans area. Most krewes are named from Greek mythology. Maskers – the float riders who are wearing masks and are dressed in costumes. 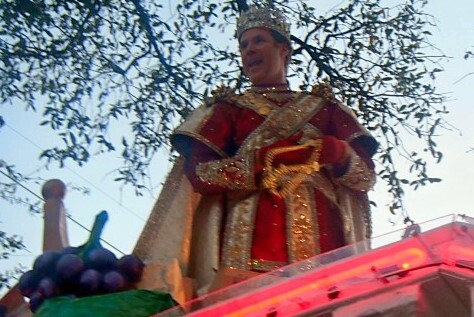 Rex – the king of Mardi Gras. Below is the 2012 Rex. Do you recognize him? 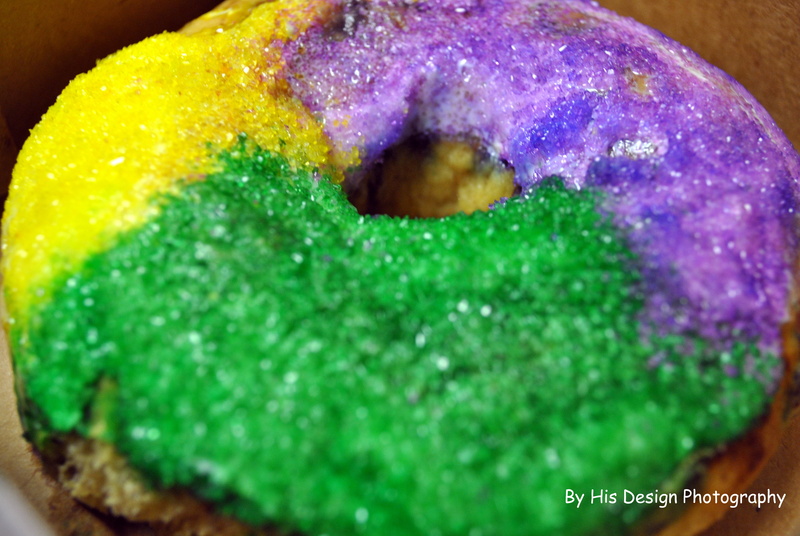 King Cake – Sweet roll-like dough is shaped into a big circle, cooked and brushed with purple, green and gold sugar or icing. Then a plastic baby, representing the Christ child, is tucked inside. Whoever gets the piece of cake containing the baby must, by tradition, provide the next king cake. 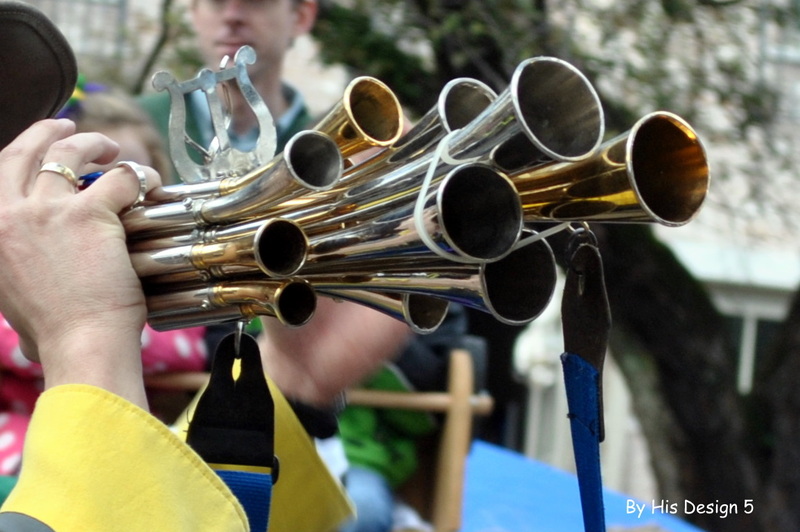 Can anyone identify this horn? Lil Sis noticed it at one of the parades and wants to know what it is. So far we have not had any luck identifying it. So…I do not count our Mardi Gras parades as field trips. However, there is a lot to learn about the history of the area and the culture. And it’s all a part of our journey! Laissez les Bon temps rouler….. If anyone would like any beads, just let me know 🙂 I will gladly send you some Mardi Gras fun!!! 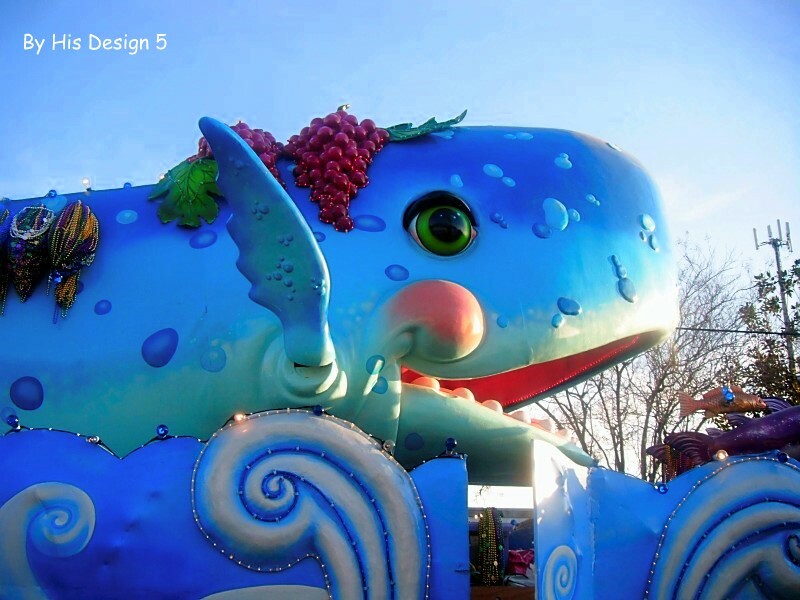 This entry was posted in Field Trip, homeschooling, Mardi Gras, NOLA and tagged field trip, homeschool, Mardi Gras. Bookmark the permalink. 11 Responses to Mardi Gras – Field trip? Love it!! 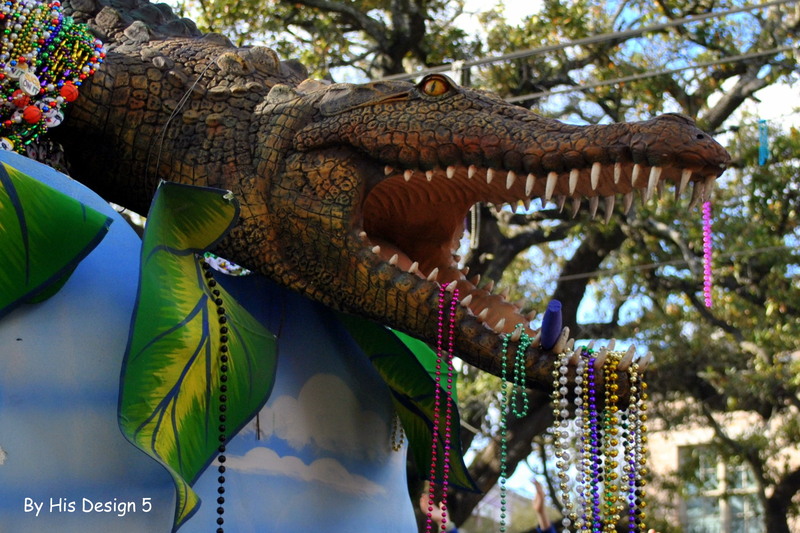 Always wanted to go to Mardi Gras – just did not know it could be kid friendly. Thanks for the history lesson. I count everywhere we travel as a field trip because we always learn something. Some just get more “credit” on the books than others. 🙂 Last year we lived in Northern Alabama and I was soo looking forward to heading to Mobile this year for Mardi Gras but that didn’t happen- instead we moved North. 😦 Love the history that you shared with this post and the great pictures. Looks like you had fun. Amazing post, quite educational, thank you for sharing! WOW!! Beautiful pictures. I love the one of the whale. The floats must be amazing. Thanks for sharing all the history. Maybe we will head down to New Orleans one year to experience Mardi Gras. Thanks again!